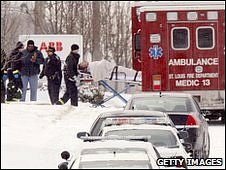 Police say a gunman who stormed a factory in the city of St Louis, Missouri, killing three people and injuring five, has been found dead. A fire department spokesman named the suspect as Timothy Hendron, an employee who had filed a lawsuit against the company. Police said the suspected shooter died from an apparently self-inflicted gunshot wound. Reports say three of the injured are in a critical condition. The shooting started at 0630 local time (1230 GMT) police said. Local radio reported that the suspect had opened fire in the car park before storming the factory. Police said the suspect was armed with an assault rifle and a handgun. According to court documents, he was involved in a legal dispute over the firm's management of employees' retirement funds. Mr Hendron and some of his co-workers accused ABB's pension-review committee of causing their retirement accounts to include investment options with unreasonable and excessive fees and expenses. Police officers searched the factory room by room. Forty to 50 workers were estimated to have been on the premises at the time, many of them hiding in offices or awaiting rescue on the roof. The factory is part of Swiss-based ABB engineering and makes power transformers.